In an attempt at answering this question Charleston’s newspaper, The Post & Courier, did the yeoman’s work of contacting all 170 state lawmakers and recording their position on the flag (see here). It’s an important bit of journalism, one that informs citizens and holds lawmakers accountable, and has drawn praise from a number of media outlets (see hereand here). As of Thursday at 5:00pm, the Senate looks certain to vote to take down the Confederate flag. At the time of this post, 33 senators have expressed their support for removing the flag while only 2 stand in opposition. With just 46 members, this clears the requisite 2/3rds majority needed to secure passage. However, the House is short of the necessary votes. While it seems like a safe bet that the lower chamber will eventually cross the 2/3rds threshold, there are reasons to be cautious. Indeed, The Post & Courier’s data suffer from a problem known as “non-response bias.” In this case, the data almost certainly overstate support for bringing down the flag. At the present time, nearly 90% of representatives support taking down the flag. However, among those that haven’t responded, 100% (all of them) are Republicans (and many are from very conservative districts). Simply put, if a large enough bloc of these “non-respondents” are secretly “no” votes, the effort to take down the Confederate flag could be in jeopardy. Looking at the breakdown of these lawmakers, it’s apparent that some (perhaps most) of the non-respondents hiding their opinion by not answering. It’s a classic—yet frustrating—problem in survey research. Looking at the bottom of the figure, William “Bill” Whitmire (R) is the most likely non-respondent to vote against removing the flag (the model gives him a 2% chance). In Oconee County—where his district is located—just 28% of voters voted for Obama in 2012. Further, only 8% are Black and Oconee County has the second largest percentage of residents over the age of 65 in South Carolina. 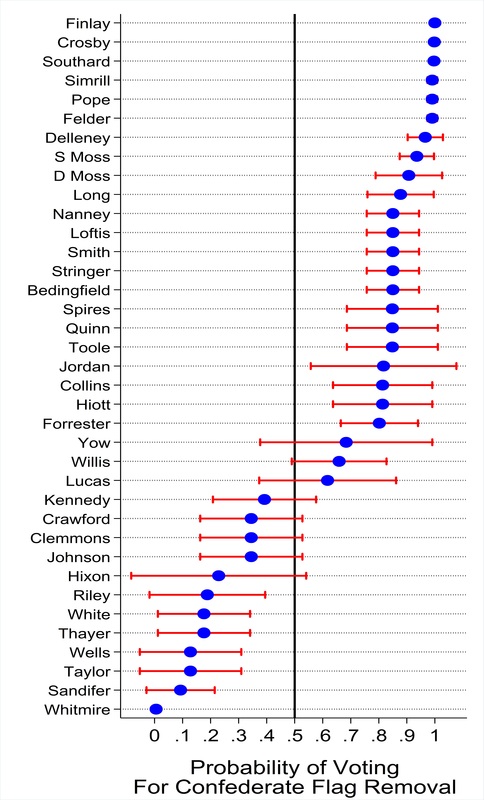 In contrast, at the top of figure, Kirkman Finlay, III (R) is the most likely non-respondent to vote for removing the flag (the model gives him a 99% chance). In Richland County—where his district is located—65% of residents voted for Obama in 2012. Richland County also has a high percentage of Blacks and residents with at least a high school degree and a low percentage of those over the age of 65. Most importantly, among the 37 hold outs, only 12 are predicted to vote against removing the Confederate flag from the Capitol grounds. In contrast, 25 are predicted to vote forremoving the flag. Note that this is based on assigning those <50% to the “no” column and those >50% to the “yes” column. An obvious caveat: there is significant variability in the model; this is not the kind of thing that can be predicted with certainty. For example, while James “Jay” Lucas is currently in the “yes” column (at 61%) and Ralph Kennedy, Jr. is in the “no” column (at 40%), it wouldn’t be that surprising if either voted the opposite way. Finally, if we include the declared “yes” and “no” respondents in the tabulation, we get a final vote total of 101-23. Needless to say, this crosses the 2/3rds threshold. A few more caveats. First, my gut feeling is that the model is too bullish on the probabilities of a “yes” vote. While I think the House has the votes to remove the flag, I wouldn’t be surprised if a number of the non-respondents in the “yes” column end up being “no” votes. Second, The Post & Courier’s dataset records support for removing the Confederate Flag in the abstract. At the present time, there are three bills that have been introduced in the General Assembly. Furthermore the committees receiving referral of the those bills can make their own statutory additions or subtractions. In the end, the nature of the bill could change the predictions dramatically.